On May 30th, 1950 our post was dedicated as the Post 555 American Legion Hall. 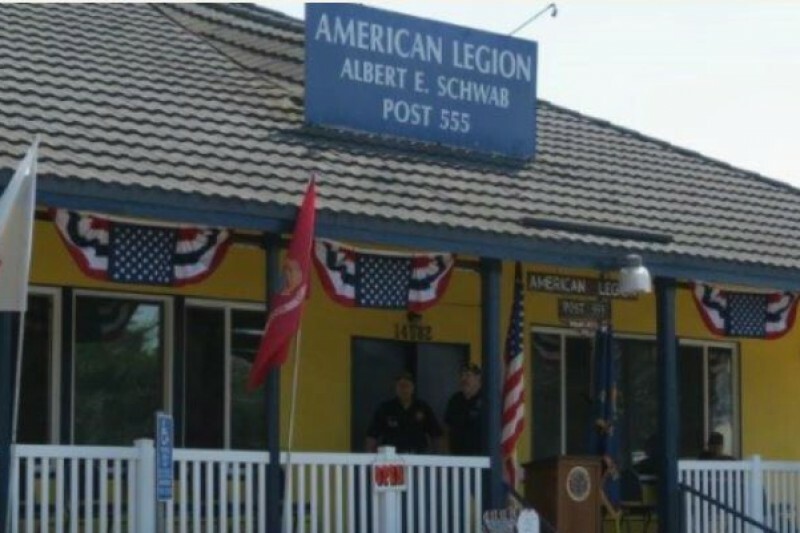 In 2001, the Post was renamed Albert E Schwab American Legion Post 555. 2016 marks our 66th year as a Legion Post. Over the years, our post has provided and continues to provide a gathering place for veterans and the local community. Just think, without veterans, active duty & reservists devoting their lives to fight for this country, we would not have the freedoms that are sometimes taken for granted. These men and women have served for us, now it’s time to step up and help save a local organization so it can continue to help the same people that have fought to protect the freedoms that make America such a great place to call home. With all the time passing, the building is in need of much renovation and repair. Many things have gone unaddressed over the years, and we are at a point where attention is required towards the buildings. Please help us keep the tradition alive by supporting our Building Repairs Fund. There are several items on our To Do list; listed below are the most important so far. Our first, and biggest fund raiser project is the replacement of the interior main hall ceiling. (see photos). Shown in photos above is a drop ceiling that is in desperate need of serious repair. 4) Add new sound, and projection equipment. 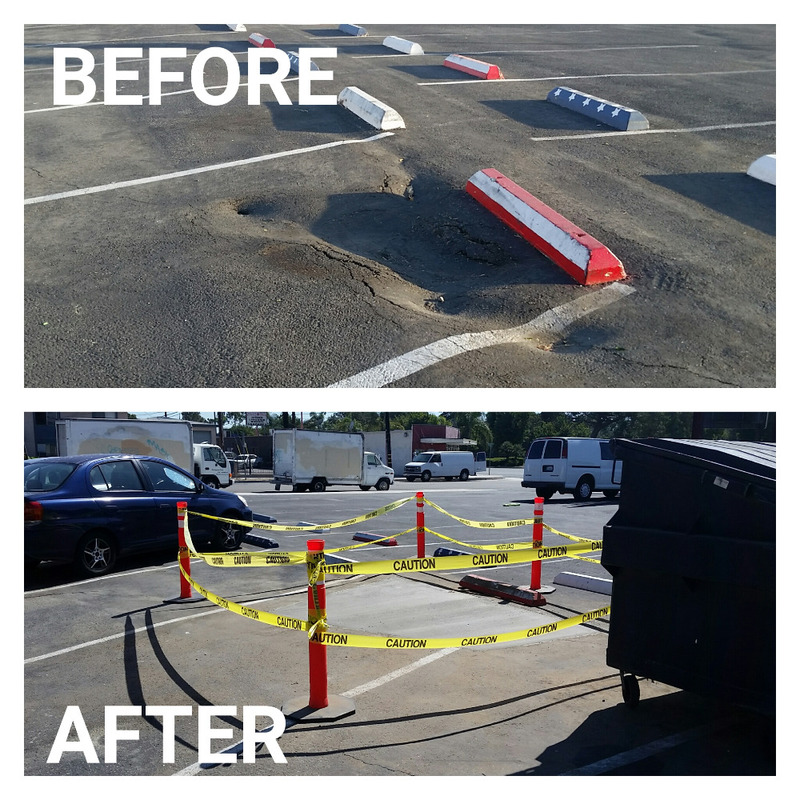 Our goal is to raise approximately $40,000 to cover this much needed repair. Our building is in desparate need of new paint. The main building has several areas of the roof and trim that exhibit dry rot and termite damage. We plan to replace these areas with new wood & paint. One of the many items needing help in the Post Cantina is bringing our kitchen up to code and making necessary maintenance and repairs to the refrigerators and oven to keep them in good working order. If the kitchen is up to par, our members can do food fundraisers to raise funds for other repairs, and post activities, and host events. We are also saving up for a new deep fryer, a kitchen aid, new pots and pans, and several other baking and cooking necessities. The refrigerators and ice makers generate a great deal of heat in the bar areas of the Main Hall and in the Annex. The installation of exhaust fans will help alleviate some of this excessive heat, and help keep our machines from overheating. There are so many projects and areas that need attention at our Post: Interior paint, doors, door hardware, decor, restroom improvements, are only a few things that we need to take care of. If you would like to find out more about ways that you can be a part of our Post 555 Legion Family success story, please visit our website and Facebook pages. With everyone's help, volunteering time and effort, Post 555 can achieve our goal of having a SAFE, relaxing, and even fun place for our Veterans and Families to enjoy! Thank you from the members and 2016-2017 officers of American Legion Post 555. Remember, all donations are tax deductible. Our Oktoberfest Event brought in $1500 towards Post Improvement - Thank you to everyone that supported! Check us out and see where your dollars are going. We have accomplished quite a bit since the last update. We have a lot of work left to do still. 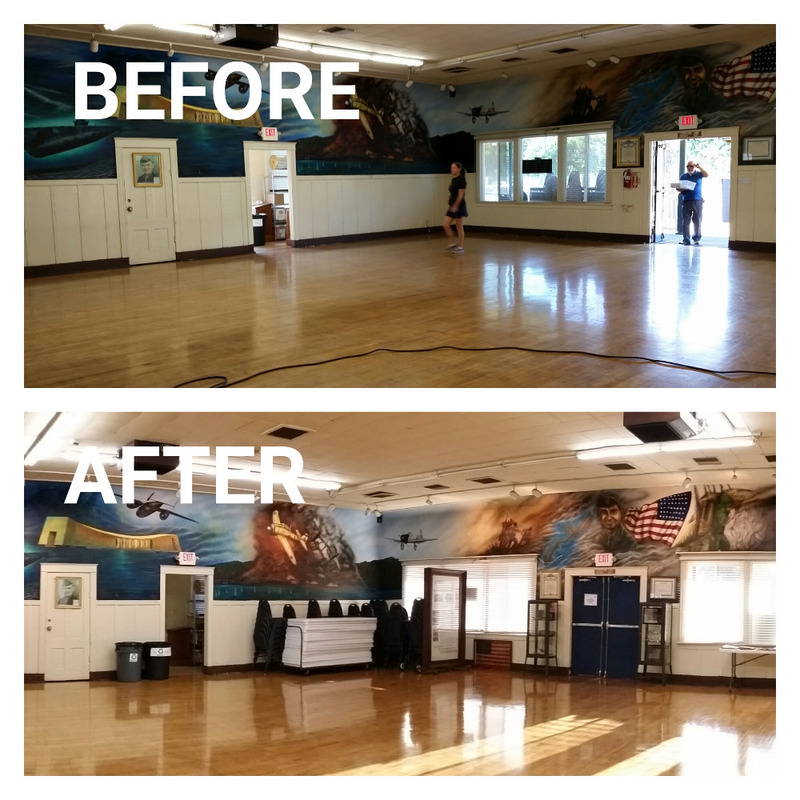 = We have the paint thank you to Kevin Griffith and Home Depot Costa Mesa. Now we need to put it on the building! = The Bar Project. A complete renovation of our bar, including expansion and reconfiguration. This is very much in progress, and we are on the home stretch. Thank you to Kevin Griffith, Jim Eubanks and Crew, Stone & Ceramic Surfaces for the counters and floors, Abel for the tile install, Beach Street Bagels Tony for the walk in... The amount of coordination required to get and KEEP these projects going is amazing. Thank you to Commander Tim for being the Project Manager for both terms as Commander. = The window in the hall (Update 2) was removed, and all cabinets and small store room (AKA old Auxiliary Office). Jim Eubanks and Team has turned that storage area into an organized storage room with cubby cabinets and a locking door. Thank you for enhancing this area. = Thank you Kevin Griffith and Team. We now have door overhangs in the bar, and on the handicap ramp. We also now have a back patio behind the kitchen. This helps lower he temperature inside the kitchen on those hot summer (every day hot SoCal) days! 2) it could not have happened without folks like you helping out via volunteering, and via donation. We have been busy around the Post! Since our last update we have cleaned up a few trouble areas such as the alleyway between the Annex and the Main Building, polished the Main Hall floor, and patched up the parking lot. These activities were HUGE! & the Post Family and people like you helped make it happen. This weekend (10/30) post members and family will help prep for the Main Building to be tented for termites on Nov. 1st. This preps the building for the Ceiling Replacement Project which is all set to begin in December and end in January. 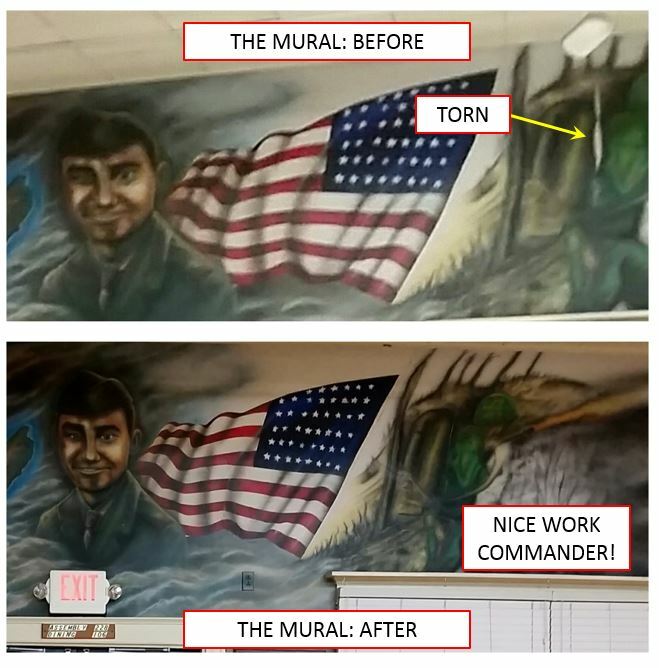 The Albert E. Schwab Mural was peeling at the seam for quite some time. Post Commander Tim with Root's help got it done and made it look easy! in the bar had been condemned since 2010! 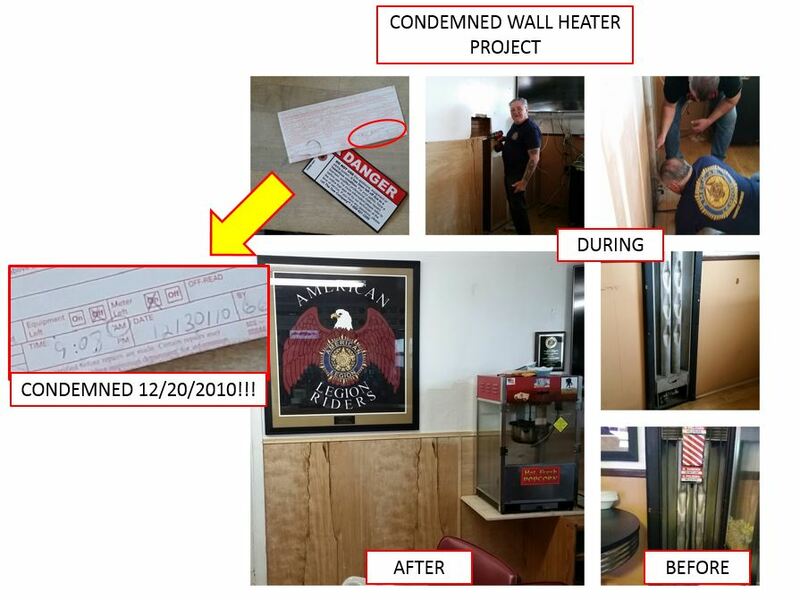 Gene, Mick, and Post Commander Tim got that heater removed, and repaired the wall with fresh drywall and trim. All we need now is to paint! Thank you to all of our donors on Saturday! Recently joined the American Legion, and Post 555 looks like a good one with great projects.